Sign-up using the form or call us at 580-536-4844 to take advantage of this exclusive offer. 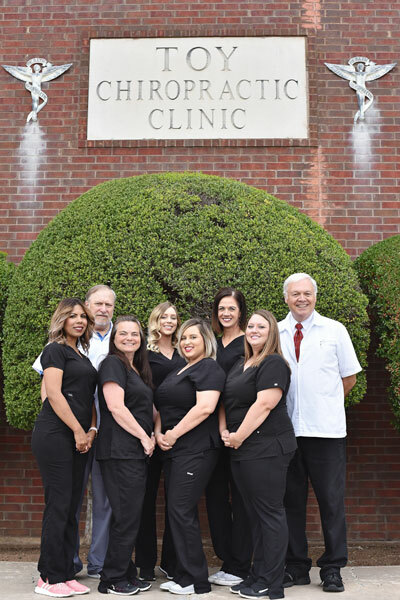 Located in the heart of Lawton, the leading health professionals at Toy Chiropractic Clinic are dedicated to helping you achieve your wellness objectives -- combining skill and expertise that spans the entire chiropractic wellness spectrum. Dr. James Toy and Dr. Douglas Smith are committed to bringing you better health and a better way of life by teaching and practicing the true principles of chiropractic wellness care. Patients seeking treatment at Toy Chiropractic Clinic with Dr. Toy and Dr. Smith are assured of receiving only the finest quality care through the use of modern chiropractic equipment and technology. The doctors and the staff have a genuine concern for your well-being! If you are new to our website, please feel free to discover and learn about chiropractic wellness. If you are interested in starting your journey towards wellness please subscribe to our award winning newsletter. If you are already a newsletter subscriber, please explore the member wellness section of our website for wellness articles, resources, and health facts---specifically targeted by Dr.Toy and Dr. Smith to your wellness needs and interests. Interferential Therapy- an effective therapy option used by many physiotherapy clinics to relieve pain and accelerate the self-healing process, getting your body back to a healthy, pain free-state. The high frequency signals of an IFC penetrate through the skin into deeper lying muscle tissues. *Purpose: To decrease inflammation in the para spinal muscles. This therapy also promotes faster healing in conjunction with the spinal manipulation. It relaxes the muscles and rehabilitates the nerves within the treatment area. Aqua Massage- a quick, convenient way to get a full-body massage. Purpose: A massage with 39 pulsating water jets that increases circulation to promote healing. This is also a very helpful therapy for a patient with fibromyalgia, lupus, and neuromuscularskeltal pain. Also good for general stress relief for day to day trauma. *Purpose: Pull the vertebrae away from each other to prepare and lengthen spine for adjustment. It is very therapeutic for scoliosis patients. Hydrotherapy- A passive treatment which massage, heat and whirlpool to have the following effects increased blood circulation for better homeostasis, decreased muscle tension for better movement, increased oxygen absorption in the blood stream for better energy, decreased inflammation and muscular toxins for better injury recovery, increased release of endorphins for better feeling of well-being, decreased blood pressure for better circulatory health and stress relief, decreased muscle guarding for better effectiveness of treatments, and increased muscular range of motion for better flexibility. *Purpose: Massage table offers the benefits of a whirlpool and immersion water therapy while remaining dry. The combination of flotation, heat, and massage produce therapeutic effects such as relaxation and blood and lymphatic circulation which aids the healing process. Diathermy- a high-frequency electric current that is delivered via shortwave, microwave, or ultrasound to generate deep heat in body tissues. The heat can be used to increase blood flow or to relieve pain. Diathermy also can be used as a surgical tool to seal off blood vessels or destroy abnormal cells. *Purpose- A therapeutic treatment most commonly prescribed for joint conditions such as rheumatoid arthritis and osteoarthritis. It is also very therapeutic for sinus pressure, congestion, pleurisy, and pneumonia. The Doctors at Toy Chiropractic Clinic use a 'whole person approach'. This approach to wellness means looking for underlying causes of any disturbance or disruption (which may or may not be causing symptoms at the time), and make whatever interventions and lifestyle adjustments that would optimize the conditions for normal function. Using this unique approach, we are able to help you to accelerate and/or maintain your journey to good health. "Know what happens when you aren't a Spring Chicken any longer & sit on the floor playing board games with Granddaughters?? ?...yep you guessed it. Thanks Dr. Toy for helping me walk again. Your staff ROCKS, too." "I was hurting so bad when I first came in, I could hardly even walk. Now just a few weeks later I feel much better. No more pain at all! Thanks Dr. Toy and staff! Oh yea, the staff are great!!!" "I had injured my right hip. I chose to go to Dr. Toy instead of the emergency room, and he and his colleague treated me. First with an X-ray, then [acupressure]. Then the wonderful Chiropractic way of laying on of hands and was healed. I did have to participate with a healthy diet, vitamins and a lot of walking. Thank You Dr. James Toy. I never had to have surgery!!!"